When it comes to Instagram fonts, options inside the app are pretty bland, right? There are some options inside stories, about 5 fonts to choose from but when it comes to the bio, captions, and comment, you just have one standard font. Only one font means it hard to stand out in the crowd. What if I told you there is a way to make your bio look a little different with some font tricks. Below I’m going to explain to you how to use custom Instagram fonts on your bio. Right, to get things straight from the start. You can’t change fonts directly inside the Instagram app but with this quick hack, you can change fonts using a font site or app. Step #1 Pick your Instagram Font. We have put together a tool that will help you choose a new font, generate text in that font, so you can copy and paste your new fancy text into your Instagram bio. All the fonts have been tested on Instagram and are compatible with the latest version of the app. You can check out our Instagram font tool here. 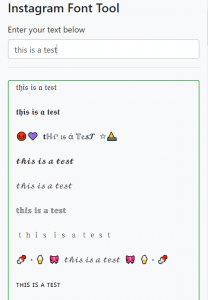 Simply type or paste your text into the text area. Then scroll down and search through the fonts to find one that suits your needs. Once you have found a font that you like, simply highlight the text by double tapping on the text and choosing “COPY”. So, you have your winning font in the clipboard. The next step is to open the Instagram app and paste it where you desire it to be shown. Below you can see an example of the font pasted in the profile & bio.